This is “Recessionary and Inflationary Gaps and Long-Run Macroeconomic Equilibrium”, section 7.3 from the book Macroeconomics Principles (v. 2.0). For details on it (including licensing), click here. Suppose an economy’s natural level of employment is Le, shown in Panel (a) of Figure 7.10 "A Recessionary Gap". This level of employment is achieved at a real wage of ωe. Suppose, however, that the initial real wage ω1 exceeds this equilibrium value. Employment at L1 falls short of the natural level. 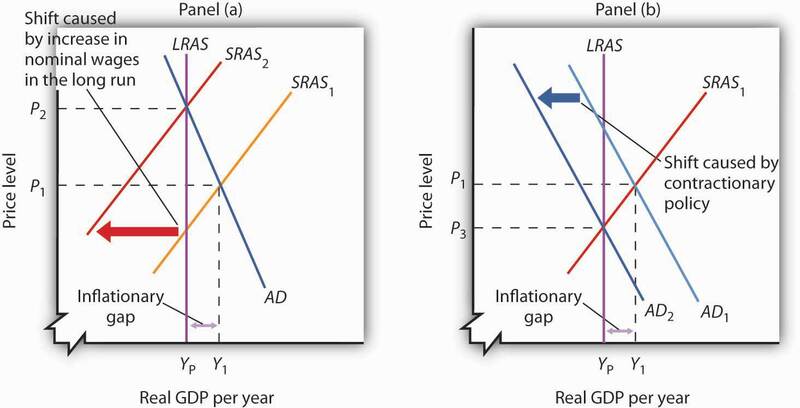 A lower level of employment produces a lower level of output; the aggregate demand and short-run aggregate supply curves, AD and SRAS, intersect to the left of the long-run aggregate supply curve LRAS in Panel (b). The gap between the level of real GDP and potential output, when real GDP is less than potential, is called a recessionary gapThe gap between the level of real GDP and potential output, when real GDP is less than potential..
Just as employment can fall short of its natural level, it can also exceed it. If employment is greater than its natural level, real GDP will also be greater than its potential level. Figure 7.11 "An Inflationary Gap" shows an economy with a natural level of employment of Le in Panel (a) and potential output of YP in Panel (b). If the real wage ω1 is less than the equilibrium real wage ωe, then employment L1 will exceed the natural level. As a result, real GDP, Y1, exceeds potential. The gap between the level of real GDP and potential output, when real GDP is greater than potential, is called an inflationary gapThe gap between the level of real GDP and potential output, when real GDP is greater than potential.. In Panel (b), the inflationary gap equals Y1 − YP. Suppose an economy is initially in equilibrium at potential output YP as in Figure 7.12 "Long-Run Adjustment to an Inflationary Gap". Because the economy is operating at its potential, the labor market must be in equilibrium; the quantities of labor demanded and supplied are equal. Now suppose aggregate demand increases because one or more of its components (consumption, investment, government purchases, and net exports) has increased at each price level. For example, suppose government purchases increase. 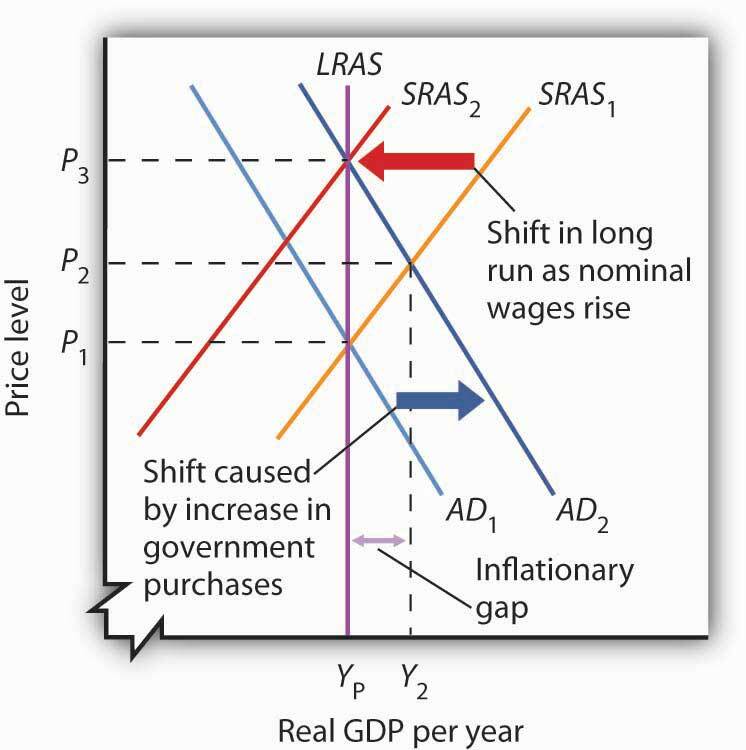 The aggregate demand curve shifts from AD1 to AD2 in Figure 7.12 "Long-Run Adjustment to an Inflationary Gap". That will increase real GDP to Y2 and force the price level up to P2 in the short run. The higher price level, combined with a fixed nominal wage, results in a lower real wage. Firms employ more workers to supply the increased output. 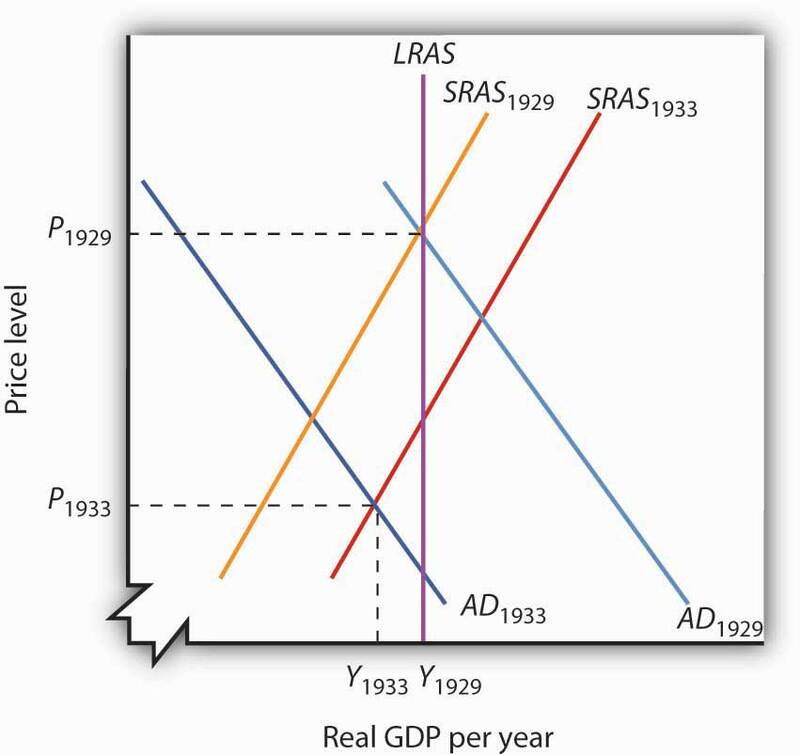 Again suppose, with an aggregate demand curve at AD1 and a short-run aggregate supply at SRAS1, an economy is initially in equilibrium at its potential output YP, at a price level of P1, as shown in Figure 7.13 "Long-Run Adjustment to a Recessionary Gap". Now suppose that the short-run aggregate supply curve shifts owing to a rise in the cost of health care. 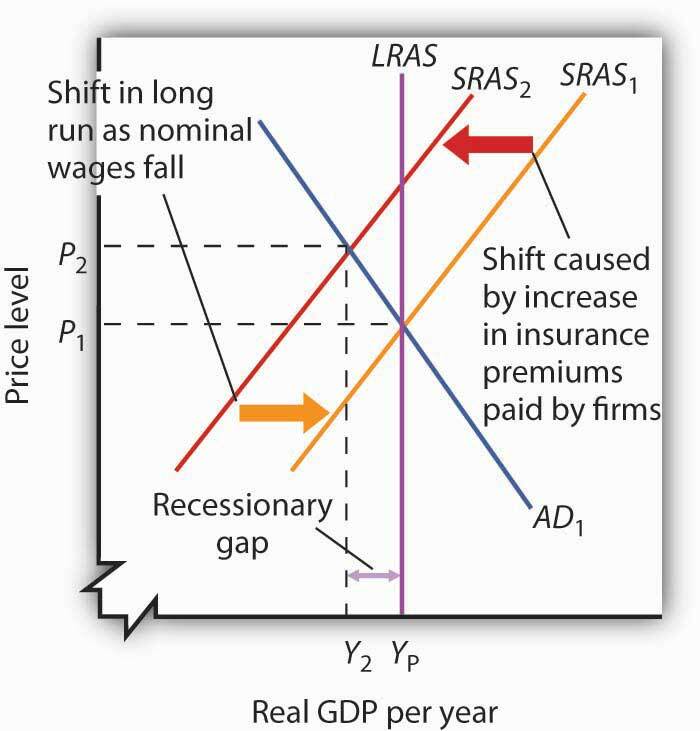 As we explained earlier, because health insurance premiums are paid primarily by firms for their workers, an increase in premiums raises the cost of production and causes a reduction in the short-run aggregate supply curve from SRAS1 to SRAS2. Figure 7.14 "Alternatives in Closing a Recessionary Gap" illustrates the alternatives for closing a recessionary gap. 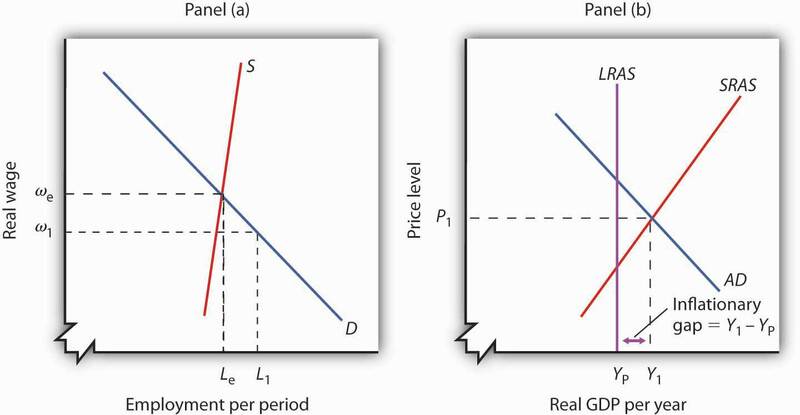 In both panels, the economy starts with a real GDP of Y1 and a price level of P1. There is a recessionary gap equal to YP − Y1. In Panel (a), the economy closes the gap through a process of self-correction. Real and nominal wages will fall as long as employment remains below the natural level. Lower nominal wages shift the short-run aggregate supply curve. The process is a gradual one, however, given the stickiness of nominal wages, but after a series of shifts in the short-run aggregate supply curve, the economy moves toward equilibrium at a price level of P2 and its potential output of YP. Panel (b) illustrates the stabilization alternative. Faced with an economy operating below its potential, public officials act to stimulate aggregate demand. For example, the government can increase government purchases of goods and services or cut taxes. Tax cuts leave people with more after-tax income to spend, boost their consumption, and increase aggregate demand. As AD1 shifts to AD2 in Panel (b) of Figure 7.14 "Alternatives in Closing a Recessionary Gap", the economy achieves output of YP, but at a higher price level, P3. A stabilization policy designed to increase real GDP is known as an expansionary policyA stabilization policy designed to increase real GDP.. Figure 7.15 "Alternatives in Closing an Inflationary Gap" illustrates the alternatives for closing an inflationary gap. Employment in an economy with an inflationary gap exceeds its natural level—the quantity of labor demanded exceeds the long-run supply of labor. A nonintervention policy would rely on nominal wages to rise in response to the shortage of labor. 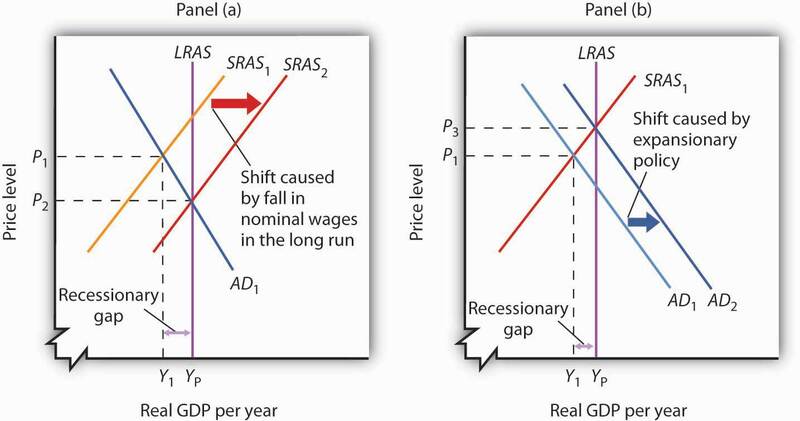 As nominal wages rise, the short-run aggregate supply curve begins to shift, as shown in Panel (a), bringing the economy to its potential output when it reaches SRAS2 and P2. How large are inflationary and recessionary gaps? 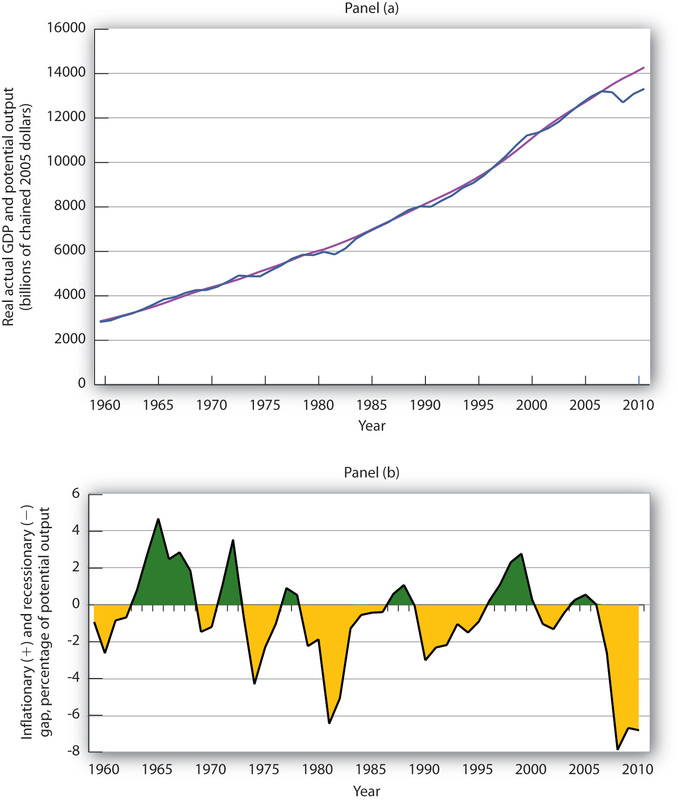 Panel (a) of Figure 7.16 "Real GDP and Potential Output" shows potential output versus the actual level of real GDP in the United States since 1960. Real GDP appears to follow potential output quite closely, although you see some periods where there have been inflationary or recessionary gaps. Panel (b) shows the sizes of these gaps expressed as percentages of potential output. The percentage gap is positive during periods of inflationary gaps and negative during periods of recessionary gaps. Over the last 50 years, the economy has seldom departed by more than 5% from its potential output. So the size and duration of the recessionary gap from 2009 to 2011 certainly stand out. Source: Bureau of Economic Analysis, NIPA Table 1.1.6 (revised February 29, 2012). Real Gross Domestic Product, Chained Dollars [Billions of chained (2005) dollars]. Seasonally adjusted at annual rates; Congressional Budget Office, The Budget and Economic Outlook: An Update, August 2011. Case in Point: This Time Is Different, Or Is It? In an analysis that spans 66 countries over nearly eight centuries, economists Carmen Reinhart and Kenneth Rogoff investigate hundreds of financial crises and the economic busts each leaves in its wake. With a database that includes crisis episodes that go back as far as 12th-century China and medieval Europe and continue until the financial crisis of 2007–2008, the authors look at the patterns of economic behavior that characterize the periods leading up to financial crises and the patterns that characterize the recoveries. They argue that looking over a long period of history is necessary because financial crises are “rare” events. Financial crises occur at varying intervals, and researchers studying a period of 25 years or so may not encounter the equivalent of a 100-year, category 5 hurricane that hits a major, low-lying city with a faulty levee system. In general, such crises follow periods of relative economic calm. For example, the period in the United States from the mid-1980s until 2007 was often referred to as the Great Moderation. During such periods, inflationary and recessionary gaps may occur, but they are relatively small and short-lived. Societies begin to feel that they have tamed the business cycle, that policy makers have gotten smarter, and that moderation will continue. But then it happens. The accumulation of too much debt by governments, businesses, or consumers leads to a financial meltdown. As housing prices are run up, for example, people tend to find ways to justify their heavy borrowing and to rationalize the ascent in prices: Demographics have changed; mortgage terms have improved; the regulation we have put in place is better this time; it’s better to buy now, before prices go up even more; housing prices won’t fall. Memories of the last crisis fade. “This time is different,” they argue. The collapse in asset market prices is large and long-lasting. Housing prices decline an average of 35% over 6 years, and stock prices decline an average of 56% over 3.5 years. Peak-to-trough GDP falls 9% on average, and the recession averages 2 years in length. The unemployment rate rises 7 percentage points over a 4-year period. Government debt swells due to bailout costs and, more importantly, because tax revenues fall off due to lower GDP. V-shaped recoveries in stock prices are more common than V-shaped recoveries in housing prices or employment. To what extent is the financial crisis of the late 2000s likely to follow this typical pattern? The authors argue that experience with expansionary fiscal policy in such circumstances is actually quite limited. Most often, governments are shut out of borrowing markets when crises hit. Japan’s government explicitly tried to implement fiscal stimulus, but the authors warn against drawing conclusions from one such example. The authors caution that governments should weigh any potential benefit of fiscal stimulus against the problem of higher public debt. They also note that central banks in 2007–2008 acted quickly and aggressively with expansionary monetary policies. But, they caution against “push[ing] too far the conceit that we are smarter than our predecessors” (p. 238). The global nature of the current situation only adds to the difficulty of recovering fully. Source: Carmen M. Reinhart and Kenneth S. Rogoff, This Time Is Different: Eight Centuries of Financial Folly (Princeton: Princeton University Press, 2009). To the graph in the previous Try It! problem we add the long-run aggregate supply curve to show that, with output below potential, the U.S. economy in 1933 was in a recessionary gap. The unemployment rate was above the natural rate of unemployment. Indeed, real GDP in 1933 was about 30% below what it had been in 1929, and the unemployment rate had increased from 3% to 25%. Note that during the period of the Great Depression, wages did fall. The notion of nominal wage and other price stickiness discussed in this section should not be construed to mean complete wage and price inflexibility. Rather, during this period, nominal wages and other prices were not flexible enough to restore the economy to the potential level of output. 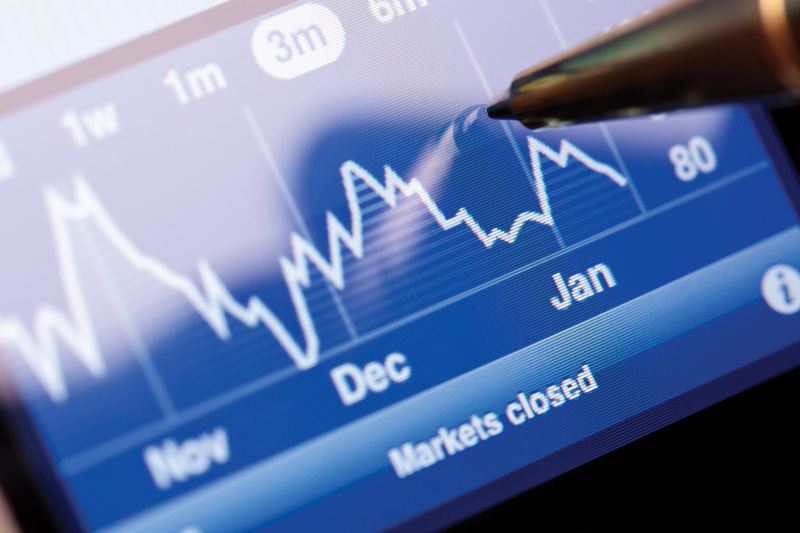 There are two basic choices on how to close recessionary gaps. Nonintervention would mean waiting for wages to fall further. As wages fall, the short-run aggregate supply curve would continue to shift to the right. The alternative would be to use some type of expansionary policy. This would shift the aggregate demand curve to the right. These two options were illustrated in Figure 7.15 "Alternatives in Closing an Inflationary Gap".